This article is about the food additive codes. For other uses, see E number (disambiguation). E numbers are codes for substances that are permitted to be used as food additives for use within the European Union and EFTA. The "E" stands for "Europe". Commonly found on food labels, their safety assessment and approval are the responsibility of the European Food Safety Authority. Having a single unified list for food additives was first agreed upon in 1962 with food colouring. In 1964, the directives for preservatives were added, 1970 for antioxidants and 1974 for the emulsifiers, stabilisers, thickeners and gelling agents. The numbering scheme follows that of the International Numbering System (INS) as determined by the Codex Alimentarius committee, though only a subset of the INS additives are approved for use in the European Union as food additives. Outside the European continent plus Russia, E numbers are also encountered on food labelling in other jurisdictions, including the Cooperation Council for the Arab States of the Gulf, South Africa, Australia, New Zealand, Malaysia, and Israel. They are increasingly, though still rarely, found on North American packaging, especially on imported European products. In some European countries, "E number" is sometimes used informally as a pejorative term for artificial food additives, and products may promote themselves as "free of E numbers". This is incorrect, because many components of natural foods have assigned E numbers (and the number is a synonym for the chemical component), e.g. vitamin C (E300) and lycopene (E160d), found in carrots. The list shows all components that have or had an E-number assigned. Not all additives listed are still allowed in the EU, but are listed as they used to have an E-number. For an overview of currently allowed additives see information provided by the Food Standards Agency of the UK. E100 Curcumin (from turmeric) Yellow-orange Approved in the EU. Approved in the US. E101 Riboflavin (Vitamin B2), formerly called lactoflavin Yellow-orange Approved in the EU. Approved in the US. 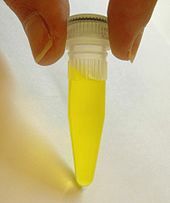 E101a Riboflavin-5'-Phosphate Yellow-orange Approved in the EU. E102 Tartrazine (FD&C Yellow 5) Yellow Approved in the EU. Approved in the US. E110 Sunset Yellow FCF (Orange Yellow S, FD&C Yellow 6) Yellow-orange Approved in the EU. Banned in Norway. Products in the EU require warnings and its use is being phased out. Approved in the US. E120 Cochineal, Carminic acid, Carmine (Natural Red 4) Crimson Approved in the EU. Approved in the US. E123 Amaranth (FD&C Red 2) Red Approved in the EU. Banned in the United States. E127 Erythrosine (FD&C Red 3) Red Approved in the EU. Approved in the US except for lake variant. E140 Chlorophylls and Chlorophyllins: (i) Chlorophylls (ii) Chlorophyllins Green Approved in the EU. E141 Copper complexes of chlorophylls and chlorophyllins (i) Copper complexes of chlorophylls (ii) Copper complexes of chlorophyllins Green Approved in the EU. Approved in the US. E143 Fast Green FCF (FD&C Green 3) Green Approved in the US. Banned in the EU. E150a Plain caramel Brown Approved in the EU. Approved in the US. E150d Sulphite ammonia caramel Brown Approved in the EU. Approved in the US. E153 Vegetable carbon Black Approved in the EU. E154 Brown FK (kipper brown) Brown Approved in the EU for dyeing kippers only, however appears to no longer be used. E160a Alpha-carotene, Beta-carotene, Gamma-carotene Yellow-orange to brown Approved in the EU. E160b Annatto, bixin, norbixin Orange Approved in the EU. Approved in the US. E160c Paprika oleoresin: (i) capsanthin, (ii) capsorubin Red Approved in the EU. Approved in the US. E160d Lycopene Bright to deep red Approved in the EU. Approved in the US. E160e Beta-apo-8'-carotenal (C 30) Orange-red to yellow Approved in the EU. Approved in the US. E160f Ethyl ester of beta-apo-8'-carotenic acid (C 30) Orange-red to yellow Approved in the EU. E161b Lutein Orange-red to yellow Approved in the EU. E161g Canthaxanthin Violet Approved in the EU. Approved in the US. E162 Beetroot Red, Betanin Red Approved in the EU. Approved in the US. E230 Biphenyl, diphenyl preservative Not approved in the EU. E231 Orthophenyl phenol preservative Approved in the EU. E251 Sodium nitrate (Chile saltpetre) preservative Approved in the EU. E425 Konjac (i) Konjac gum (ii) Konjac glucomannane emulsifier Approved in the EU. May not be used in confectionery owing to choking risk. E499 Stigmasterol-rich plant sterols Approved in the EU. E500 Sodium carbonates: (i) Sodium carbonate (ii) Sodium bicarbonate (Sodium hydrogen carbonate) (iii) Sodium sesquicarbonate (acidity regulator) raising agent Approved in the EU. E501 Potassium carbonates: (i) Potassium carbonate (ii) Potassium bicarbonate (Potassium hydrogen carbonate) acidity regulator Approved in the EU. E503 Ammonium carbonates: (i) Ammonium carbonate (ii) Ammonium bicarbonate (Ammonium hydrogen carbonate) acidity regulator Approved in the EU. E504 Magnesium carbonates: (i) Magnesium carbonate (ii) Magnesium bicarbonate Magnesium hydrogen carbonate acidity regulator, anti-caking agent Approved in the EU. E514 Sodium sulphates (i) Sodium sulphate (ii) sodium bisulphate acid Approved in the EU. E515 Potassium sulphates (i) potassium sulphate (ii) potassium bisulphate Approved in the EU. E1518 Glyceryl triacetate or triacetin humectant and flavour solvent Approved in the EU. E1520 Propylene glycol humectant and flavour solvent Approved in the EU. ^ "Food labels". Live Well. NHS Choices. Retrieved 26 December 2012. ^ Snelson, Matthew. "Explainer: what are E numbers and should you avoid them in your diet?". The Conversation. Retrieved 2017-11-18. ^ Codex Alimentarius. "Class Names and the International Numbering System for Food Additives (Ref: CAC/GL #36 publ. 1989, revised 2009, amended 2011)" (PDF). Retrieved 15 December 2011. ^ a b c d e f g h i j k l m n o p q r s t u v w x y z aa ab ac ad ae af ag ah ai aj ak al am an ao ap aq ar as at au av aw ax ay az ba bb bc bd be bf bg bh bi bj bk bl bm bn bo bp bq br bs bt bu bv bw bx by bz "Current EU approved additives and their E Numbers". United Kingdom: Food Standards Agency. 2010. Retrieved 26 November 2010. ^ a b c d e f g h i j k l m n o p q r s t u v w "Summary of Color Additives for Use in United States in Foods, Drugs, Cosmetics, and Medical Devices". United States Food and Drug Administration. ^ "Food additives". CBC News. 29 September 2008. Archived from the original on 2013-09-09. ^ "E700-E799 (antibiotics)". Sigma-Aldrich. Retrieved 17 December 2018. ^ New Zealand Food Safety Authority. "Identifying Food Additives" (PDF). Retrieved 6 December 2017. The Food Additives and Ingredients Association, FAIA website, UK. This page was last edited on 9 April 2019, at 14:18 (UTC).